Michaela and Blake worked with us to create a gorgeous invitation set to fit their romantic starlight theme for their wedding at The Manor House in Mason, OH. We recently got to celebrate the wedding of one of our own designers, and the bride and groom were up to no good! Check out the fun, nerdy wedding invitations designed by the bride herself as we share this very special Real Wedding! Wedding Season is in full swing here at World Digital Imaging, and we've begun to notice a trend. 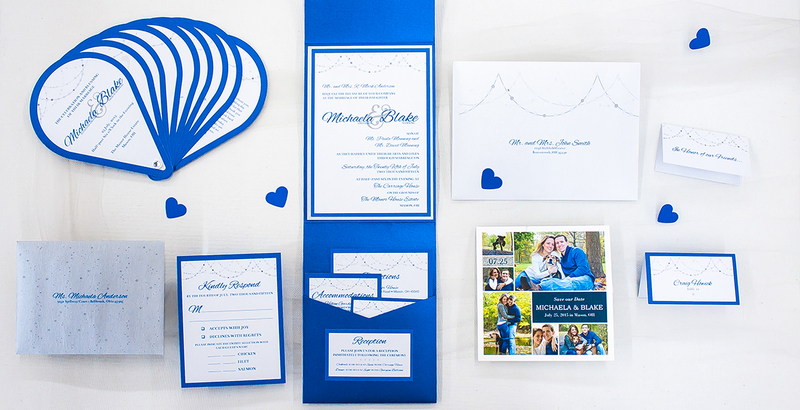 This year's most popular color for weddings seems to be blue! So since we've seen so many weddings using shades of blue, we figured we'd gather up some inspiration and create a few moodboards of our favorite blues for you! Is your family turning you into a Bridezilla? The Newly Engaged Guide to Wedding Stationery: Part 2 – What Do You Need, and When?